The 30.75 metre motor yacht El Patron, listed for sale by Nautique Yachting, has been sold in an in-house deal within two months of coming on the market. 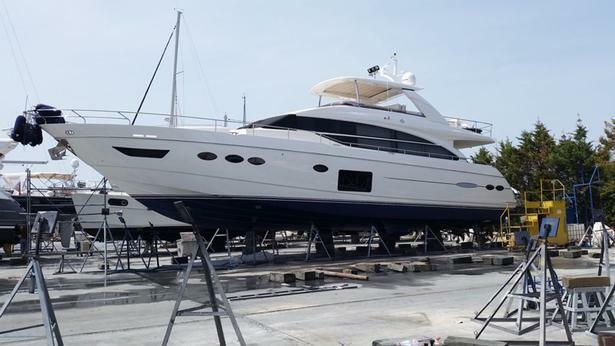 Built in GRP by Italian yard Azimut to a design by Stefano Righini, El Patron was delivered in 2006 as a Leonardo 100 model. Accommodation is for up to eight guests split across four cabins including a full beam, en-suite owner’s cabin amidships, a VIP suite forward, a double and a twin. All cabins feature built-in flatscreen televisions and music systems. There are also crew quarters for four situated aft on the lower deck. She features a spacious saloon on the main deck with 180-degree panorama doors providing a light and welcoming atmosphere. The main saloon also incorporates a lounge area and pop-up television system, as well as a dining table for eight with a bar area aft, allowing both spaces to be used in conjunction for entertaining. El Patron boasts generous outdoor spaces with a large sun deck complete with Jacuzzi, plenty of sunbeds and a barbecue and bar area, offering plenty of space for al fresco dining. The engine room, galley and tender garage are all located on the lower deck. She is powered by twin 2,000hp MTU V16 diesel engines and is fitted with Trac digital zero speed stabilisers. She has a maximum speed of 28 knots and a cruising speed of 15 knots with a range of 600 nautical miles. El Patron was asking €2,000,000.